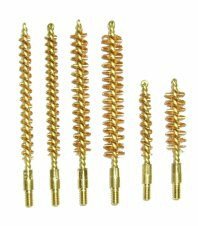 Pro Shot Bronze Bore Brushes - .17, .20 (204), .22 rimfire (.223), .22 centerfire (.224), 5.6 NATO .243, 6 mm, .257 (ie 25-06), .264, 6.5 mm, .270, . Bronze brushes scrub rifle bores without damaging the rifle bore surface... That's because bronze is softer than steel... But That's Not All! Pro Shot Bronze Bore Brushes have a unique brass core... So that even if the core of the brush touches your rifle barrel bore or muzzle crown, it won't do any damage... That's because brass is also softer than steel. This special bronze brush, brass core approach to making bore brushes is a Pro Shot innovation that has made them the favorite of competitive shooters and accuracy lovers around the world. All Brushes have 8-32 thread, except .17 & .20 cal which is 5-40 thread. Order Extras... Brushes DO Wear Out - You want the brush to wear out, not the rifle barrel bore. Order the Pro Shot Bronze Bore Brush that fits your caliber. It will fit the bore snug when its new. As you use it, it will gradually wear out and get to have a looser fit. Eventually it'll be time to replace it. Use your wore out brushes for smaller calibers or for patched bore cleaning with Bore Paste. We have brushes, jags, patches, cleaning rods, and rod accessories on our Gun Cleaning Hardware Web Page. All other gun cleaning and service related products are on our Shooting Accessories Page. Available in the following calibers: .17, .20 (204), .22 rimfire (.223), .22 centerfire (.224), 5.6 NATO .243, 6 mm, .257 (ie 25-06), .264, 6.5 mm, .270, .277, .284, 7 mm, .30, .308, 7.62 NATO, .338, 9 mm, .357(pistol) .358 (rifle), .375, 10 mm, .41 (pistol), .416 (rifle), .44 (pistol), .45 (pistol), .45 (rifle), .50 (pistol), and .50 (rifle).